When the ploughed-out tesserae were counted, weighed, measured and otherwise assessed, the excavation team decided to experiment with the surplus material. 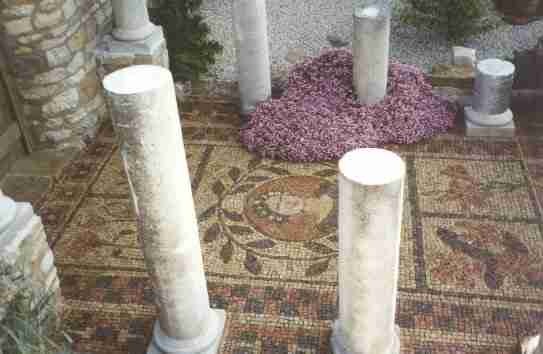 Several mosaics were laid using original materials to establish the likelihood of patterned mosaics in the villa. Shown below is one of the larger examples. A geometric border with 5 panels, the central roundel is a bust of the Goddess Flora surrounded by a chain of bay leaves. The four adjacent panels each contain a representation of a plant within the surrounding garden.